Comes from a family of restaurateurs; from his grandparents who founded the “Hogar del Pescador” restaurant in Santurce to “Sea Grill” in Getxo, run by her parents. He studied hospitality in Artxanda (ESHA) and after his first professional contact with Fernando Canales and Carlos Posadas, decided to dedicate his time in body and soul to his true passion: Japanese cuisine. After learning from the best chefs in Spain and London, he continued his training in Japan in the high traditional Japanese cuisine restaurant “Watahan” in Fukuoka, Kyushu Island. 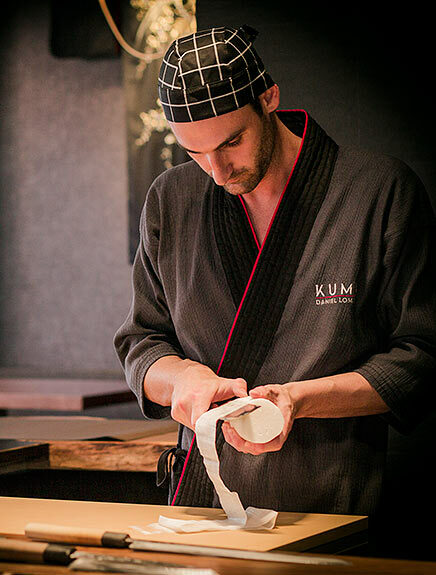 It was time to venture out to fulfill his dream, and with the support of his family, he created KUMA in Bilbao. KUMA is a restaurant where the dishes are surprisingly, where new and unknown products are used, and where you can feel a warm family atmosphere. Daniel works in view of commensals who are lucky enough to see him work live, closely followed by his brothers in the dining room. The familiar team he has surrounded himself with, respects and understands the importance he gives to the values and qualities of KUMA cooking, fusing traditional and pure Japanese cuisine with a twist renovated air for our joy.